We are sometimes quizzed on why professional breeders are needed and asked why we intentionally breed puppies when there are dogs in rescue centres that don’t have a home. The answer is one that requires a little explanation and understanding of where puppies and dogs come from and where they tend to end up. A professional breeder is knowledgeable, experienced and responsible. They have a lot invested in their breeding programme financially and emotionally and dedicate the vast majority of their time to it. Their breeding programme is likely their primary source of income and this is not something that they should be scrutinised for – they are professionals, they do a great job raising great puppies and work at it round the clock, 365 days per year. They may even have a team working alongside them to provide the very best care for their dogs and puppies. They are council-licensed and produce their puppies themselves on their own premises, taking temperament, health and conformation seriously. 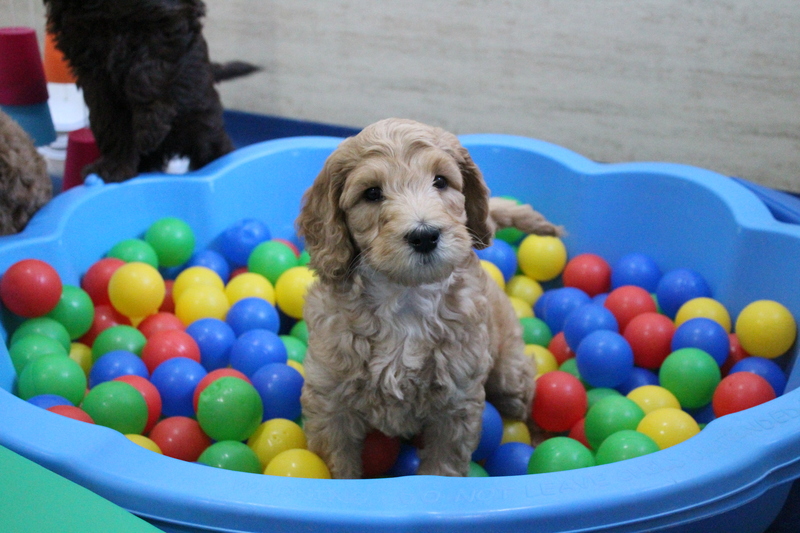 They only place their puppies in suitable, properly-vetted homes where they are confident their puppies will be well cared for and appropriately trained. The resulting dogs are usually healthy and well-balanced compared to dogs resulting from other establishments. Puppies that are bred by professional breeders and placed in appropriate homes tend to live with their new family for life. An occasional breeder usually has limited knowledge and experience since they are not breeding often. Since they are operating on a smaller scale, they are most likely not council-licensed and may not have very much invested in their breeding programme financially or emotionally. This could mean their facilities are below par and they may not have invested in appropriate health screening of their breeding stock. The puppies might be showered with love and affection at evenings and weekends, but during the week, everyone is probably out working whilst the puppies are home-alone. This results in underdeveloped puppies which will never reach their full potential. They are more likely to be hyperactive, less trainable and will not be as emotionally stable. They are also more likely to develop health issues if the appropriate parental health screening was not carried out. Whilst many people set out to buy a puppy from an occasional breeder because they like the romantic notion of their puppy being lavishly raised in front of the living room fireplace, this is usually far-fetched. The reality is that the majority of occasional breeders either intentionally or inadvertently cut corners which have a lasting effect. Whilst these puppies will more often than not end up living with their new family for life, this will be due to the new owner’s love, care and dedication regardless of the expense or hard work – not the breeder’s parental health screening policy or puppy raising knowledge, experience or techniques. A puppy dealer usually buys puppies at a ‘wholesale’ price from an indiscriminate breeder/puppy farm that is interested in nothing beyond profit. The dealer will likely have very limited knowledge and experience and will almost definitely have no true information about each individual puppy’s health or parentage. They often operate from their own residential property and might pose as the breeder of the puppy to make the sale and may even forge documentation to be more convincing. It can be very difficult to spot! The resulting dogs often have a myriad of health issues due to the lack of parental health screening and lack of early health care. Their development is often slower than others due to their lack of socialisation and exposure to new experiences in their early weeks. They are often shy and nervous, and this is often not correctable at a later date. Be cautious of adverts on websites where lots of breeders advertise their puppies – look out for one seller with multiple adverts, sometimes using different names and phone numbers to disguise the fact that they have so many puppies of different breeds all available right now. Dealers are only concerned with making as many sales as possible and will take no interest in where the puppies end up. Many of these puppies eventually end up in shelters or rescue centres, either because their owners were not properly vetted or educated during the purchase process and had not given due consideration to the undertaking of dog ownership, or because their owners cannot afford the healthcare and treatment that the dogs need in later life due to a lack of parental health screening. An indiscriminate breeder or puppy farm is usually a breeder producing puppies with the singular motive of turning the maximum profit. This means that they cut costs wherever possible, usually at the expense of the health and welfare of the puppies they are raising. They typically have no genuine knowledge or experience, are irresponsible and may not even track which parents are bred and what puppies are produced. The puppies are often raised in dirty, unhygienic conditions and are often sick at the time of sale. Their operation is usually sizable – they ‘stack them high and sell them cheap’. When we say stack, we are not joking – if you run a Google image search for puppy farm or puppy mill (warning – these images are distressing) you will see many of these so called “breeders” literally stack puppies on top of each other in crates, living in cramped and confined conditions. Since puppy farms aim to minimise costs, they are usually under-staffed, and the dogs and puppies don’t receive basic care never mind training, love and affection. Many of these puppies eventually end up in shelters or rescue centres, either because their owners were not properly vetted or educated during the purchase process and had not given due consideration to the undertaking of dog ownership, or because their owners cannot afford the healthcare and treatment that the dogs need in later life due to a lack of parental health screening. Many rescue centres and shelters do a wonderful job in caring for dogs when their previous owners are not able to, or have decided that they don’t want to, with a view to re-homing these dogs with permanent families. These facilities tend to be charitable and rely heavily on donations. They are usually under-funded, and staff and volunteers are spread thin. Dogs in rescue centres and shelters are often unstable and may have health complications – they typically require a lot of work in training and the financial security to pay for ongoing veterinary treatment. The main problem here is that the rescuer does not know the history of the dog they are rescuing. If you are an experienced dog owner with no young children in or visiting your home, and you have lots of time and financial resources to dedicate, adopting a dog from a rescue centre or shelter is a fantastic thing to do. Unfortunately, though, the majority of folks don’t fit the bill and are just not cut out for rescuing. From time to time, we (and all other professional breeders) receive ‘hate email’ from uneducated individuals who think that earning a livelihood from breeding puppies is morally wrong. They are of the opinion that everyone should ‘adopt, not shop’ when it comes to adding a dog to the family. They think that professional breeders are the source of the problem. This is, quite frankly, short-sighted and simply untrue. 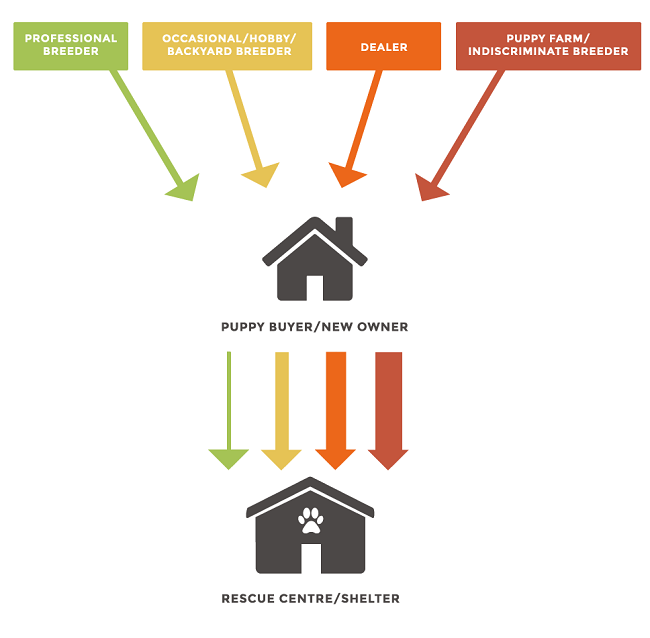 Puppies bred by occasional/hobby/backyard breeders and puppy farms, or sold by dealers, are much more likely to end up in rescue centres and shelters than puppies bred and sold responsibly by professional breeders. Whilst some people are perfectly set up to adopt dogs from rescue centres and shelters, most are not, and the solution is not to persuade or coerce unsuitable families to adopt – the dogs will just end up back in rescue centres and shelters. We need to stop dogs ending up in rescue centres and shelters to begin with. To do this, we need to stop occasional/hobby/backyard breeders, puppy farms and dealers from producing and selling puppies. Whilst there is a profit to be turned, these operations will continue – so we need to cut off their stream of profit. There is just one way that this can be done – we need to stop buying puppies from these people! As soon as the demand disappears, the supply will too, and the canine species will be so much better off. If you visit one of these below-par establishments and see a puppy, you will feel compelled to rescue him from the conditions he is in and give him a loving home. On the face of it, you feel like you are doing a great thing, but you are funding the wider problem and keeping these shady establishments in business. The best thing you can do is walk away and report the “breeder” to your local council authority, the SSPCA or the RSPCA. They produce good quality, healthy, well-adjusted puppies that tend to live with their families forever with fewer and less significant health issues. If we are going to stop buying puppies from disreputable establishments and reduce the number of dogs in rescue centres and shelters, but still want to have man’s best friend in our homes and lives, we need to be sourcing our canine friends from professional breeders who know what they are doing.